Vermiculite for structural engineering is a chimney insulation mass. It is supplied dry from the factory, as a premixed insulation mass made of the light anorganic aggregate Vermiculite and a hydraulic binding agent. Vermiculite for structural engineering may be used for the production of an insulating layer with a thickness of at least 2.5 cm with and triple casing house chimney with a clear diameter of 900 cm². However, the authorised inner casing is maximum 15 m. Vermiculite for structural engineering may be used for individual chimneys and for groups of chimneys. Chimney groups may not be more than 2 clear chimney cross-sections and have a ventilation shaft for the ventilation of a special installation area for fireplaces. The introduced and fastened insulation mass is a mould-resistant, non-flammable insulation layer. For reducing the diameter on house chimneys, Vermiculite for structural engineering may be introduced with a higher preparation water content. 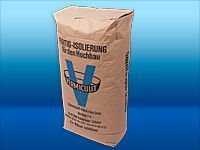 Vermiculite for structural engineering is to be mixed with 1.8 litres +- 0.1 litres of water per kg of insulation mass for at least 3 minutes in a free fall mixer. Further substances may not be added. The mix batches must contain the full contents of one or several sacks. The mixture is to be poured in between the inner and outer side of the moulded pieces of the inner casing in sections of a maximum of 50 cm. By picking, Vermiculite for structural engineering is to be compressed by around 15 volume % and otherwise to be compressed so that a cavity-free insulation layer is created. The insulation layer must encompass the whole inner casing including the bearing joint under the lowest moulded piece in the scheduled property.